All that out of the way, it’s a pleasure to share what we did. In the interest of lightest yuloh weight possible, the loom (long skinny part of the yuloh, between the blade and the handle) is thinner than what appears in most yuloh plans. This works fine for me, in propelling AUKLET, which weighs about 2 1/2 tons on the truck scale, loaded… If somebody wants to really put their weight into their yuloh operation, thicker would likely be better. Since that original auklet blog post, Dave Zeiger has done another article on yuloh design, found here: http://triloboats.blogspot.com/2014/04/yuloh-20-and-beyond.html, working from the design by Slieve McGalliard. Slieve’s original article can be found here: http://www.junkrigassociation.org/slieve (go to this link and click on the title “Yuloh efficiency.pdf”) This original “recipe” is what Theo and I worked from to make the yuloh design for AUKLET, whose waterline length is about 19 feet. We made three sockets, since it was easy and allowed for using different positions to see which one would work best. I’m glad for that – the one nearest the handle works well, while the other two jump off the pin badly. All are 5/8 inch deep, and are a rounded 1/2 inch across at the inside end of the socket, flared toward the outer edges to 3/4 inch. The socket that works the best has worn away with use, on the port and starboard sides, to produce a little more slope; this has seemed helpful. Because of the sloping pedestal on the trailer hitch ball (see photo below), when the yuloh rocks far to one side or the other, it is levered off the ball. This is not good! I expect that a machinist (or maybe just somebody with a file) could alter that sloping pedestal on the trailer hitch, but it seems like just rounding off a 1/2 inch bronze rod would be simpler, if it doesn’t cause the same problem. 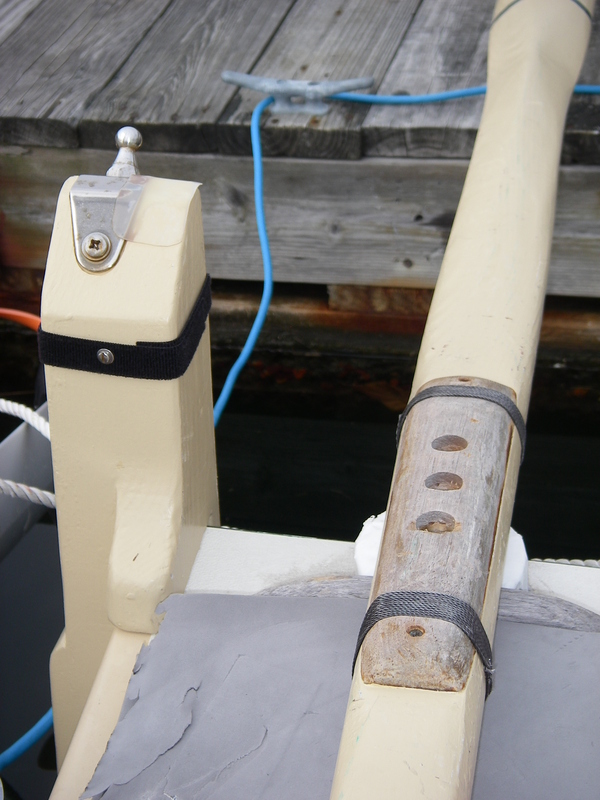 The removable part that we call the “yuloh post,” which brings the pin to the correct height on the transom, puts the top of the pin at 33 inches above the waterline at the stern of AUKLET. 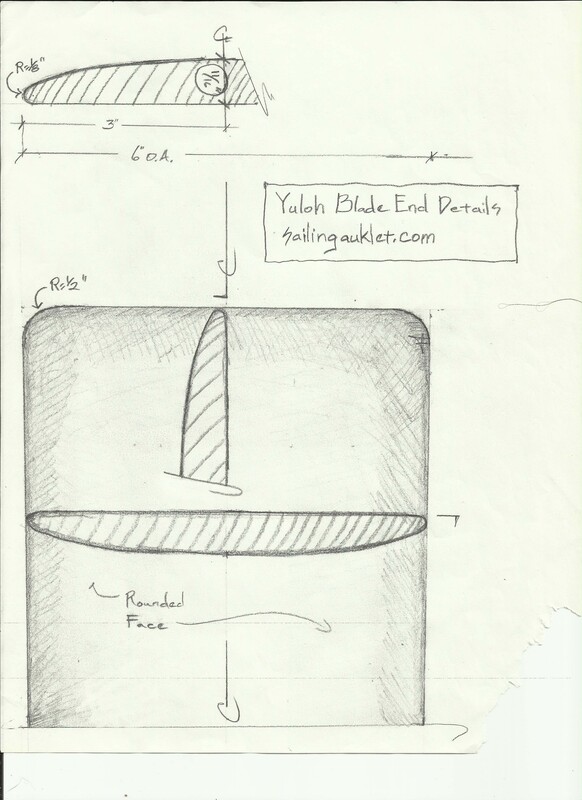 It is my feeling that getting the correct pin height above the waterline is an important part of making a yuloh design work properly, so that it requires the least effort in use; guidelines for determining pin height are included in the above articles. I think that’s everything that wasn’t covered in the previous post. I remain enormously happy with the yuloh. Since I have spent a lot of time in the guilty activity of sculling with the rudder (which can be quite hard on the equipment), there’s a pretty good base for comparison as far as efficiency. The same amount of effort applied to the yuloh makes the boat move along very well, while the rudder version, though it also works, requires a lot more effort to cover the same distance. Yuloh operation takes a little getting used to. After initial frustrations while actually underway, I practiced a lot at anchor, which helped, and it is now a smooth process that makes a real difference when the wind quits. An extra half-mile in or out of harbor is quite doable, and with average strength, as other people have demonstrated, it’s possible to really cover some distance in a cruising sailboat, with quite a bit of ease. Blog programs provide statistics to do with readership, and the yuloh material on this blog receives by far the most attention of any individual post here. It’s fantastic to see so much interest in this elegant, traditional way of moving one’s boat. It would be great fun to see yulohs become commonplace here in the west! Since this writing, we did indeed modify the socket on the yuloh that receives the bicycle hitch pin. We modified the middle socket, seen in the following photo, sloping the edges of the port and starboard sides. The yuloh responded very well to that, doing a much better job of staying on its pin. Carol Hasse, tour of her folkboat. Some ways into this video there is a detailed, close-up, view of her yuloh and its mounting hardware. Extremely well done. Nice post. I’ve used a yuloh on a Bay Hen. Went nice a straight. Couldn’t back up… However: looking at the “yuloh post” gives me a hinkey feeling about my upcoming hip failure…. Oh I can see how it would do that – yikes! I didn’t have a clue what a yuloh was until reading all tis neat information! 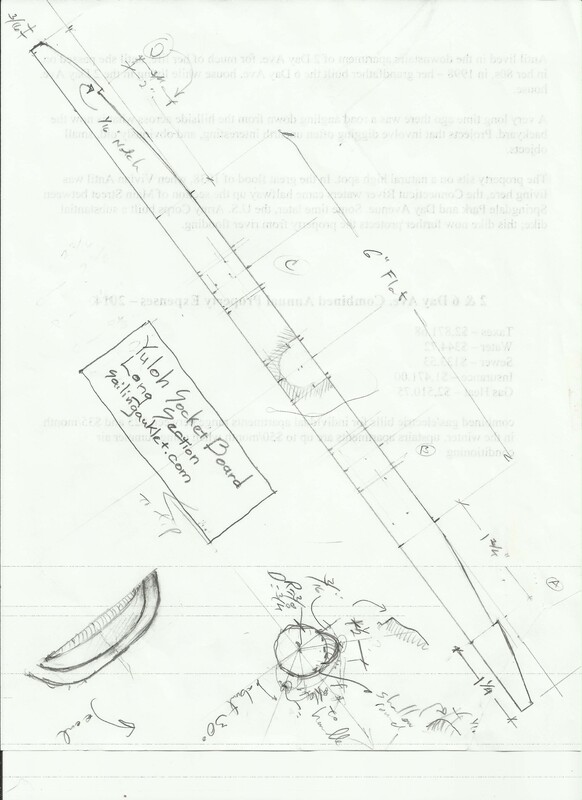 In my youth I sculled over the stern of my rowboat with an oar in a notch, and am planning on something similar for propelling my Puddle Duck Racer (8 ft o.a. about 16″ transome top to water); I’d wondered how one could manage such propulsion on a larger craft. 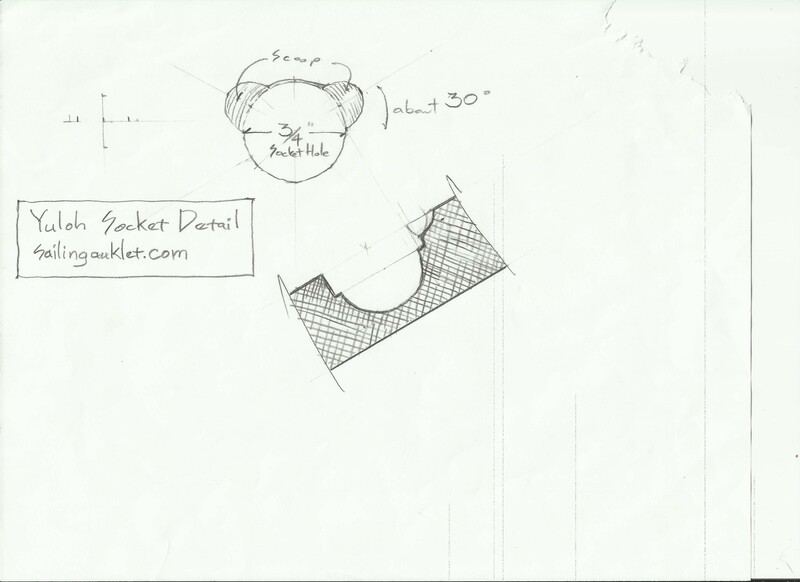 That’s fun that you’ve had experience with sculling – the oar in a notch system is a great thing. If you find that nowadays the repetitive twisting for sculling gets to be a bit much, that’s when the yuloh really shines. The combination of the bend in the loom and the lanyard takes care of almost all the twisting – lots easier on wrists and elbows, when you really just need to push and pull, without muscling the blade angle with each stroke. Scaled down for a PD Racer would be pretty interesting!